the jewel in Paradigms new Signature line." Sound "An exceptionally pure-sounding speaker." "Through the mids and highs, the S1 v.2s were ultra-revealing, ultra-controlled," and "the stage they cast defied their small size." " They had great articulation down low -- for as low as they go, anyway" -- "about 60Hz or so." "The S1 v.2s required some power to reach loud levels," but give them "enough juice and you should be astonished at what kind of performance you achieve given their size and price."
. According to Paradigm, whereas well-designed aluminum-dome tweeters break up just above 20kHz, which is uncomfortably close to the audible range, beryllium goes past 50kHz before trouble sets in." "The mid-woofer uses Paradigms Co-PAL cone, which is made of cobalt-infused pure-aluminum, has a solid-aluminum phase plug and an inward-rounded rubber surround. " "The cabinet isnt made of MDF or some other kind of thick wood. Rather, its die-cast aluminum thats just 5mm thick." Use "The S1 v.2 is a sealed-box design. One disadvantage of that is the loss of the port contribution in the low end (about 3dB). One benefit is that the speaker can be placed close to a wall without concern for the output of the port." Value "Something of a benchmark at $1500. Many speakers priced much higher cant match the midrange and high-frequency transparency and detail of these little fellas." For more than 20 years, Canadas Paradigm Loudspeakers has received heaps of praise for many things about its speakers -- strong engineering, excellent performance, high value -- but good looks usually hasnt been one of them. In fact, not many years ago, almost all of Paradigms speakers came in one shape: rectangular. There wasnt a curve in sight. Furthermore, all Paradigm speakers used to come clad in vinyl veneer, something that rarely gives buyers the inkling to rub their hands all over them and make them showpieces in their rooms. 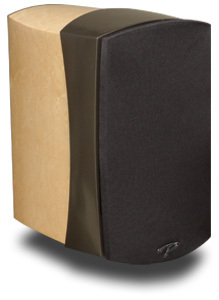 Basically, Paradigm speakers of yore were great to listen to and affordably priced, but nothing much to look at. But thats been changing, probably because todays market demands speakers that complement the appearance of a room instead of detract from it. As a result, Paradigms newest creations not only have curves, but also come in shapes and sizes that I never could have imagined from the company a few years ago. And many now have real-wood veneers too. But, despite this new emphasis on appearance, Paradigm hasnt seemed to abandon the strong engineering and commitment to value that it is known for. Enter the Reference Signature S1 v.2, which is priced at $1499 USD per pair (in cherry; $1699 in high-gloss piano black or birds-eye maple), a wickedly innovative take on the traditional two-way speaker design that proves you can have good looks and not sacrifice a thing when it comes to sonic performance and price. The Signature series, which is Paradigms top line, represents the company's highest standard of construction and performance. The v.2 is the latest generation of Signature, and the S1 is the newest speaker to be added to the line. In the original Signature lineup, there was no S1; the entry point was the S2. The S1 v.2 is 10 1/2"H x 6 3/4"W x 8 3/4"D -- fairly small, even for a two-way. In fact, its really small when you consider that it has a 6" mid-woofer -- almost as wide as the cabinet itself. Paradigm can do that, though, because the cabinet isnt made of MDF or some other kind of thick wood. Rather, its die-cast aluminum thats just 5mm thick. Therefore, theres still enough space inside the box to get that woofer in, which there wouldnt be if there were inch-thick walls. In addition, aluminum is reasonably light -- each S1 v.2 weighs about 12 pounds -- but is also very rigid, which can be good for a loudspeaker enclosure, providing it doesnt ring like a bell. Metal resonates, while wood-based materials, like MDF, dont. To avoid those nasty resonances, the enclosures casting includes extensive bracing that makes the inside honeycomb-like. And to further combat resonance, Paradigm has damped key spots inside with a mastic layer -- a gooey damping substance. Whats more, the cabinet is actually a two-piece affair, where the front part that includes the baffle cups the drivers and the back is held firmly in place with long screws that are inserted through it. Once the screws are tightened, the structure is extremely strong and solid. As a result, the S1 v.2 didnt ring or rattle, no matter where I hit it. Formed into the baffle are a waveguide for the tweeter and the basket for the mid-woofer. The waveguide controls the directivity of the tweeter in order to help make a better blend between the low end of the tweeter and the top range of the mid-woofer. The interesting thing about the formed mid-woofer basket is that Paradigm claims that that driver has greater rigidity than if the basket were separate and bolted on. Additionally, because the all-in-one casting eliminates driver joints, heat dissipation is increased, improving thermal performance, which results in greater power handling. In terms of the S1 v.2s finish, according to Paradigm, putting thin wood veneer on aluminum wasnt easy, particularly because the cabinet is curved. Someway, somehow they did it, at least on the cherry and birds-eye maple versions. The piano black version, on other hand, doesnt have veneer; rather, it has umpteen coats of black paint that are polished. But whether its the veneer or black finishes, the S1 v.2s craftsmanship is outstanding. Now, about the drivers. Theyre both produced in-house at Paradigm and new for Signature v.2. The tweeter has a 1" beryllium dome, which might have some people drooling as soon as I mention it. Ultra-light, super-stiff beryllium is all the rage these days. According to Paradigm, whereas well-designed aluminum-dome tweeters break up just above 20kHz, which is uncomfortably close to the audible range, beryllium goes past 50kHz before trouble sets in. Of course, theres more to the tweeter than just the dome. Theres the dual super-neodymium magnets, heatsinks, ferro-fluid cooling, and on and on. To the best of my knowledge, the S1 v.2 is the least expensive speaker on the market to have a beryllium-dome tweeter. The mid-woofer uses Paradigms Co-PAL cone, which is made of cobalt-infused pure-aluminum, has a solid-aluminum phase plug and an inward-rounded rubber surround. Once again, this driver is only in the Signature series, and the goal is to produce something thats stiff and light that keeps nasty distortions out of its passband. Contrary to that for most of Paradigms speakers, the cabinet doesnt have porting for the mid-woofer. Instead, the S1 v.2 is a sealed-box design. One disadvantage of that is the loss of the port contribution in the low end (about 3dB). One benefit is that the speaker can be placed close to a wall without concern for the output of the port. The tweeter and mid-woofer are said to cross over at 2100Hz with third-order electro-acoustic slopes. 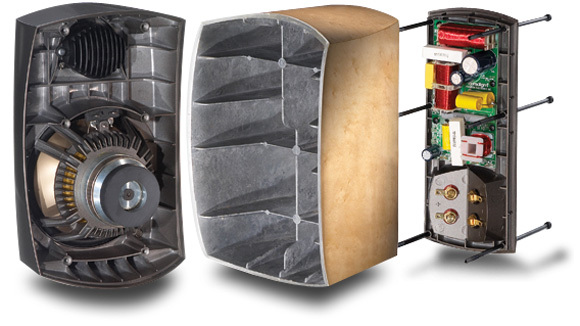 Electro-acoustic refers to a combination of the electrical crossover elements in conjunction with the natural acoustic roll-off of the driver. The back panel has two sets of binding posts for biwiring or biamping, but the S1 v.2s come with jumpers already in for single-wiring, which is how I used the speakers. Grilles that use magnets for attachment are also provided. Unlike most grilles, these are actually attractive and dont degrade the sound all that much. In fact, I had no problem leaving them on for much of my listening. However, for critical listening, I did take them off. Finally, the manufacturer-supplied specs. Sensitivity is rated at 84dB under anechoic conditions, a little lower than average, meaning you should partner these speakers with a reasonably powerful amplifier (not that hard to find these days; 50Wpc on up should be sufficient to get respectable volume levels); impedance is said to be 8 ohms, par for the course with most speaker designs; and the -10dB point in the bass is at 58Hz, which means that the speaker delivers reasonable bass but really needs to be augmented with a subwoofer if you want to plumb the depths. Finally, one spec that isnt listed by Paradigm but was mentioned by one of the companys lead designers. From the get-go, the S1 v.2 was designed to produce prodigious SPLs -- upwards of 110dB. Thats very loud, particularly for a speaker so small. Obviously, that means the S1 v.2 is pretty robust, but also that it can be used in a full home-theater setup without hesitation. 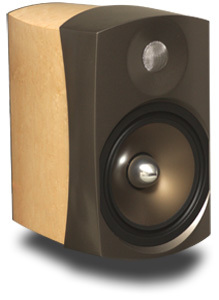 No surprise, then, theres a matching C1 v.2 center-channel speaker and ADP1 v.2 surrounds that are built the same way. With rounded panels, including the bottom, the S1 v.2 did trip me up a bit because I didnt ask for the matching GS-30 stands ($319 per pair), to which the speakers bolt right on. Instead, I planned to simply place the S1 v.2s on my 24"-high Foundation stands, not thinking about the rounded speaker bottoms and the stands flat tops. For a few moments, then, after the S1 v.2s arrived, I went, "Hmmm." Obviously, flat on the stands, the S1 v.2s will rock like Weebles, and they will fall down. What I did was stick four half-inch-thick, half-moon rubber bumpers on my stands that supported the corners of the S1 v.2 and kept the curved bottom from touching the top of the stand. It worked well; the speaker was stable. However, one suggestion I have for Paradigm is to offer a curved-top mat with a flat bottom the exact dimensions of the S1 v.2's bottom for mounting on a stand or bookshelf, similar to what KEF supplies with the Reference 201/2, which allows you to lay it on its curved side. I ran the S1 v.2s with all-Simaudio electronics. At first, it was the Moon Evolution SuperNova CD player, P-7 preamplifier, and W-7 amplifier. Thats all pretty pricey stuff -- about 20 grand for the whole kitncaboodle. But I also used the new entry-level CD-1 CD player and i-1 integrated amplifier, which are $1500 apiece. Speaker cables were Nirvana S-L, and a Nirvana S-L interconnect was also used between the CD-1 and i-1. However, for the Simaudio Moon Evolution electronics, I used two balanced runs of Nordost Valhalla. 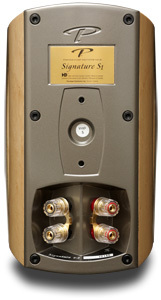 When I first listened to the S1 v.2, I heard such a pure and transparent midrange presentation with such sweetly extended highs that I knew that the speaker would make for an interesting comparison to Signature S2 v.1 -- the old Signature-series entry model that retailed for about $2000 when it debuted. But if you've never had an inkling of what the original S2 sounds like, which is the case for most people who audition the S1 v.2, youll more than likely marvel at this S1 v.2s midrange detail and transparency, youll probably be in awe of the high-frequency extension that goes off into the stratosphere without a hint of grain or hash, and youll be in wonderment at the tonal neutrality that makes voices and instruments sound exceedingly natural. The S1 v.2 is an exceptionally pure-sounding speaker, with midrange and high-frequency presentations that set a new standard for cleanliness and transparency at the $1500 price point. For example, Margo Timmins voice on The Trinity Session CD [RCA 8568-2-R] is rendered with an angelic, feathery lightness that gives the performance see-through transparency and unravels a wealth of detail, some of which Ive only heard on megabuck speakers like the JansZen Model One and Aurum Acoustics Integris Active 300B. Whats more, whereas sibilance could become exaggerated on this track with a good number of speakers that Ive auditioned over the years, particularly at high volumes, the S1 v.2s kept that in check. There was no exaggeration of the nasties, even when the speakers were driven quite hard. Through the mids and highs, the S1 v.2s were ultra-revealing, ultra-controlled. However, the mids werent so light and feathery that they lacked detail and presence. Rather, Timmins voice just hovered in space with such starkness and life that it was noteworthy for how real it sounded, particularly from such a small speaker. Male vocals, too, came out just as well. The Eddie Vedder-penned soundtrack for Into the Wild [RCA 715944] was conveyed with such startling presence that you would swear you were listening to speakers that were quite a bit bigger. On tracks like "Society" and "Guaranteed," the S1 v.2s created awe-inspiring illusion of a real singer performing in my large room, not just in terms of tonal accuracy and presence, but because the stage they cast defied their small size. Riding up into the highest frequencies, cymbals had that same feathery lightness and never sounded splashy. Furthermore, even at super-high volume levels, when the cymbals hit hard, I didn't get that "bacon-frying" crispness that so many tweeters deliver at the top end -- some even at moderate volume levels. As well, the pluck of the guitar can often sound too "plucky" -- in other words, too much string and not enough finger, which, to my ears, is almost always attributable to some sort of distortion, whether a resonance or otherwise. The S1 v.2s plucked away with exceptional control and clarity, never getting tizzy, edgy or hard. Whether this performance in the upper mids and up top was due to the beryllium dome or some other aspect of the tweeters design, I cant say. What I can say, though, is that from the mids through the highs, the S1 v.2 is more refined than any like-priced speaker Ive heard. On the other hand, the bass, while exceptionally tight and controlled to the point that it might fool some into thinking that theyre hearing more down low than is there, didnt really go all that deep. In-room response is always a guess at the best of times, so heres my best guess: about 60Hz or so, and shortly after that it fell off the cliff. Frankly, thats not bad at all given the speakers size and the absence of a port, but its not all that far-reaching either. In fact, you can spend less money, even in Paradigms own line, and get a bigger speaker with a bigger woofer that goes lower. However, if youre like me and value tight bass but dont need especially deep bass, you can certainly get away with using the S1 v.2s sub-less, for a while anyway, and perhaps look to add one later as an upgrade. The 60Hz or so that they reached is quite respectable, and weighty enough that these speakers certainly didnt sound "light." For example, when I was listening to Mark Knopflers Kill to Get Crimson [Mercury 1724910], I was impressed with how rich and vibrant the S1 v.2s sounded. They had great articulation down low -- for as low as they go, anyway. My own plan, then, is to revisit these later with a sub as a follow-up. I have no doubt that a sub will increase the bass, but my real goal is to hear if I can maintain that kind of fidelity right down to 20Hz. If so, the results could be truly extraordinary. The only other real downside to this speaker is its low sensitivity, although this can be taken with a grain of salt if you have a beefy amplifier. The S1 v.2s required some power to reach loud levels, but so do other speakers Ive reviewed recently. In fact, there seems to be a recent trend toward low sensitivity for high-quality stand-mounted speakers. The Usher Audio Technology Be-718, KEF 201/2, Dynaudio Confidence C1, all come in under the 85dB mark in the NRCs chamber, which is lower than average. But low sensitivity has nothing to do with sound quality; rather, its an indicator of how much power youll need. With something like the S1 v.2s, and the other speakers I mentioned, that means more than average power. Simaudios 50Wpc i-1 worked exceptionally well for me, and that company is always known for meeting or exceeding its power specs. So, its a real 50 watts. But I wouldnt want to partner the S1 v.2s with much less -- particularly with some low-powered tube amp that can barely meet its own specs -- unless the listening room is quite small and/or the playback levels are fairly low. So give the S1 v.2s enough juice and you should be astonished at the kind of performance you achieve given their size and price. As I said before, the entry point for the original Signature line was the S2, which, when introduced, cost $1999 per pair for the standard finish. Today, the new S2 v.2 is $2299 in cherry, $2599 in piano black or birds-eye maple -- a little bit more than the original v.1 model, and quite a bit more than the S1 v.2. Comparing the S1 v.2 to the S2 v.1 is interesting (providing you can keep the model numbers straight), not so much in terms of purchasing new, because youll only find the S2 v.1 on the used market, but to find out what Paradigm now offers as the new entry-level speaker in Signature series for $500 less than the previous entry point. As youll read, theres some give and take. The much larger S2 v.1 has deeper, stronger bass, which results in a fuller-sounding presentation. It can also play much louder with less power. These differences arent all that subtle, and not all that surprising either, given the difference in the speakers size and the fact that the original S1 was quite a bit more sensitive. You could get away with driving it with a tube amp. On the other hand, with what I heard from the Signature S1 v.2, its obvious that Paradigm has made strides in midrange and high-frequency presentation, most likely a result of the latest driver technology. When I first reviewed the Signature S2 v.1, I praised it for how clean it sounded, particularly the highs. In fact, no speaker I'd heard at that price or lower sounded as clean and detailed. However, the new tweeter of the S1 v.2 sounds cleaner and sweeter, and the midrange is more refined and detailed, allowing for a better look into recordings. This performance is why the S1 v.2 can be considered something of a benchmark at $1500. Many speakers priced much higher cant match the midrange and high-frequency transparency and detail of these little fellas. In fact, I have no doubt that the S1 v.2 could be a great nearfield monitor; perhaps Paradigm should offer gun-metal gray or unfinished aluminum for recording studios. Theres a bit of a difference in the overall tonal balance as well. The original S2 wouldnt be called forward by any stretch of the imagination -- PSBs Platinum M2 is more forward-sounding than the S1 -- but it does present a more up-front perspective than the S1 v.2, which seems a touch more laid-back, especially in the upper-mids, despite unraveling more detail there. Therefore, some might still like the way voices "pop" with the S1 v.2s; however, I preferred the sound of the S1 v.1s, which were slightly more relaxed but every bit as detailed. Finally, coherence -- how well the drivers merge their output. Basically, do the speakers drivers sound "as one"? The original S2 had no trouble in this regard, sounding as coherent and cohesive as any two-way out there (providing that your ears arent inches away from the drivers). However, the S1 v.2 sounded so coherent, even from a short distance away, it almost sounded like a single-driver speaker. Even when I got very close, the individual drivers were hard to localize. Furthermore, the speakers disappeared into the soundstage phenomenally well, creating a slightly better stereo illusion of performers in the room than even the original S2. While the S1 v.2 is less sensitive than the S2 v.1 and cant deliver the same kind of deep bass, this comparison showed me that Paradigm has found ways to improve upon the original Signature series in other ways, particularly the midrange and the highs. Whats more, its better in that regard, but at a lower price. My only question now is, What does the new S2 v.2 sound like? The Signature S1 v.2 not only impressed me but surprised me as well. The surprise came about because of the styling. Not that many years ago Paradigm was spinning out mostly wood-based rectangular boxes that were far more about performance than looks. The compact S1 v.2 not only looks good for a Paradigm speaker, it looks very good, period. Whoever came up with the concept for this little gem should get a raise. However, even though the appearance was an important aspect of S1 v.2s design, it didn't come at the expense of good sound, which is often not the case with speakers that strive for high style. The S1 v.2 sounded fantastic, and while it wont be praised for having the deepest bass in the world, the depths that it can reach were achieved with impressive tautness and control, and from the upper bass through the treble, its transparency, resolution and refinement set a standard for like-priced speakers to match. Partner the S1 v.2 with a subwoofer of commensurate quality, get it dialed in just right, and you might be able to achieve full-range sound quality that few other speakers can match. Thats what I plan to try next. Exceptional build quality, great looks, fantastic sound, and a very reasonable asking price -- to my eyes and ears, the S1 v.2 is not just the new entry point but the jewel in Paradigms new Signature line. Price: $1499 USD per pair in cherry; $1699 in birds-eye maple or high-gloss piano-black finishes.